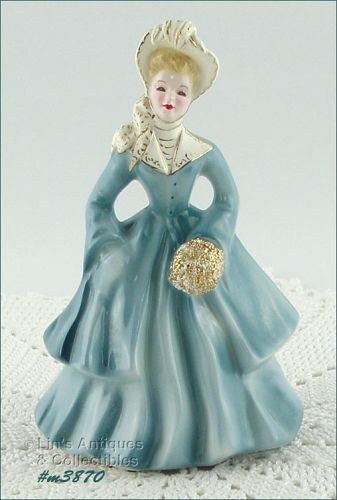 I purchased this neat Kreiss napkin lady to add to the two ladies I have in my collection. Unfortunately, I failed to remember that my ladies are the shorter size so I’m listing this pretty green napkin lady for sale. 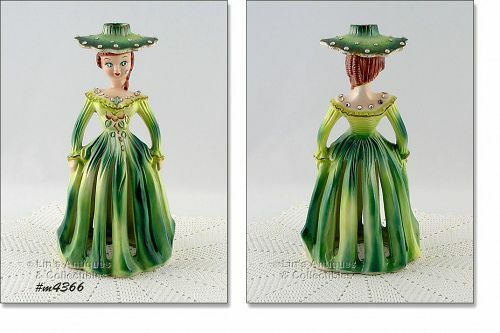 She measures 10 ¼” tall (at tallest) and will hold a candle in the top of her hat. She’s decorated with rhinestones and she’s in excellent condition. Bottom is stamped: “Kreiss 1959” and she has a tiny “Japan” paper sticker. Super addition to a collection! 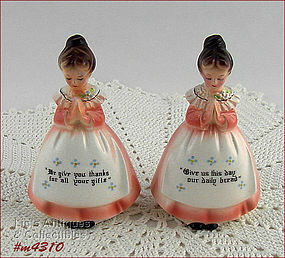 Excellent condition Enesco Prayer Lady shaker set! The salt shaker has a tiny production fired-on flake on back – not detrimental – that’s it! 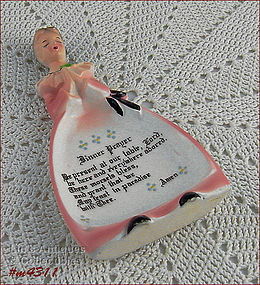 This listing has an Enesco Prayer Lady spoon rest! She measures 5 ¾” long (at longest) and 3 ¼” wide (at widest). Spoon rest is in wonderful condition – she has a teeny glaze flake of missing color on her hair (in front) and a super teeny one on end of her nose (I could feel it but it’s only visible with a magnifying glass!). as often happens with these spoon rests, tips of shoes have been color touched-up. 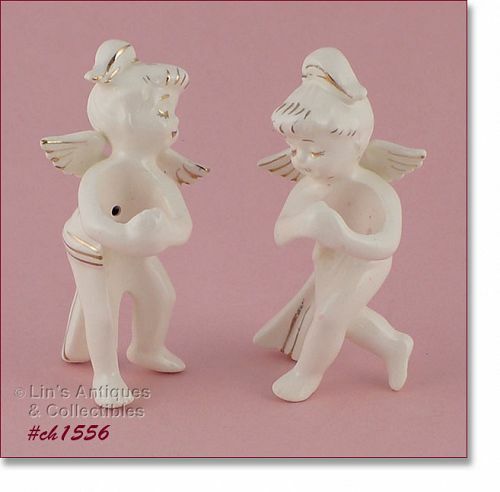 Very nice item, nicely priced to reflect minor imperfections! Excellent condition shaker set! 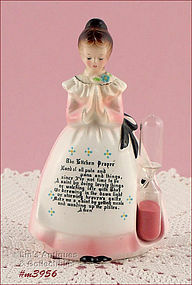 Made by Enesco, shakers are from the pretty Prayer Lady (Mother in the Kitchen) line. These have pink “dresses”, dark brunette color hair, and measure 4 ¼” tall (at tallest). Very pretty! 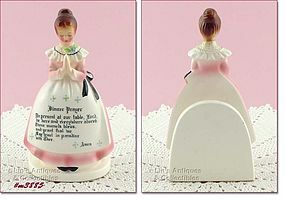 Another very nice Prayer lady timer by Enesco! She’s in very good condition with a tiny ding on her collar and she has a couple teeny rough places in her hair that may have been color touched up – not detracting – and as with most of these timers, the original elastic has broken and been replaced. There is a vintage button on back to prevent the elastic from slipping through the opening. Nice addition to a collection, somewhat difficult to find item. 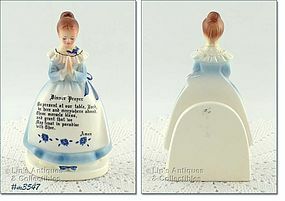 Excellent condition Prayer Lady napkin holder! 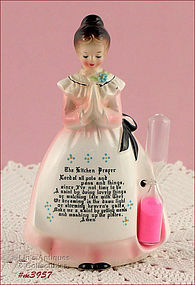 Produced by Enesco, this prayer lady has the more difficult to find white dress. She still has the original Enesco red and gold foil sticker/label and she looks new and unused. Super! 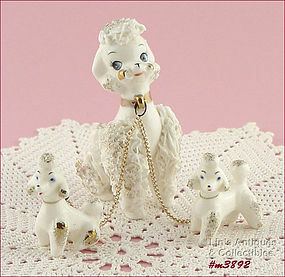 This is a cute spaghetti poodle family – mama and her two babies! She measures 4 ¾” tall, babies measure 2 1/8” and 2 3/8” tall. Mama has white spaghetti with gold color accents. Babies have in-mold “spaghetti” that is highlighted with gold color. Chain (leash) is shiny and is apparently a replacement for the original which is often broken or missing. Poodles are in super condition! 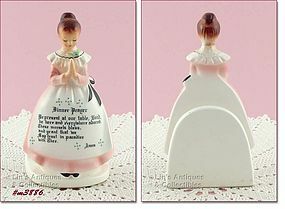 Another excellent condition Enesco Prayer Lady napkin holder! This one has the lighter pink color dress and still has the original red/gold foil sticker/label. Super!! 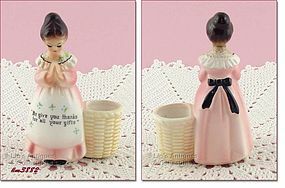 Excellent condition Enesco Prayer Lady napkin holder! Her dress is a little darker pink and her face has very pretty color. She still has the original red/gold foil sticker/label. Extra nice! 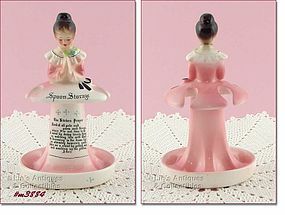 Another super nice Enesco Prayer Lady spoon storage (holder)! She’s in wonderful condition and still has the original Enesco red and gold foil label/sticker. The only evidence of “use” (??) is a teeny rough place on her bow loop – could be production (I’m not certain) but it is not detracting to this lovely lady!! 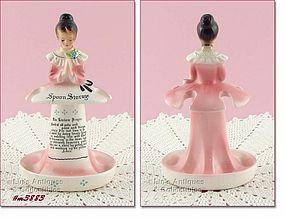 This listing has a Prayer Lady spoon storage (holder) by Enesco! She measures 6 1/4” tall and is in excellent condition with no “use” evidence. She has a tiny (pin head size) glaze pop on lower back where bowl of spoon would rest – this is production and is non-detrimental. Super nice item! 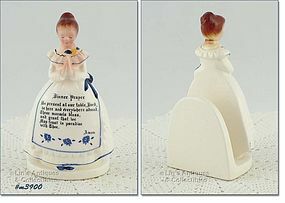 This lovely Prayer Lady (Mother in the Kitchen) napkin holder is not perfect and is priced accordingly. She has been bumped and sustained a clean break to her neck that has been nicely re-glued – the repair is barely noticeable! Nice item, nicely priced! !